SHEFFIELD, UK - AMETEK Land, a world leader in temperature measurement, combustion efficiency and emissions monitoring, has launched an exciting new website: www.ametek-land.com. 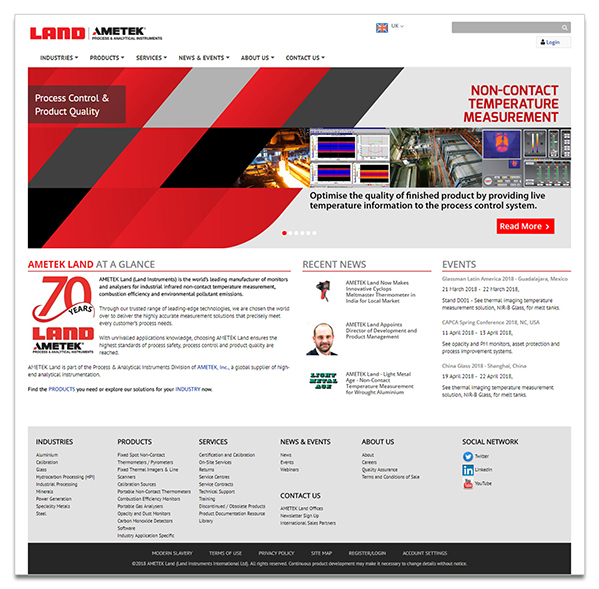 The redesigned website provides extensive product, technical and application information to help visitors understand AMETEK Land’s full product range. Technical documentation, product videos, and application case studies work together to provide a detailed overview of AMETEK Land’s capabilities across a wide range of industry sectors. The website details the capabilities of specific instruments for each of AMETEK Land’s core markets, including aluminium, glass, hydrocarbon processing, industrial processing, mineral extraction, power generation, speciality metals and steel production, and shows how they are used in specific industry applications. The AMETEK Land product line includes fixed spot non-contact pyrometers, fixed thermal imagers and line scanners, calibration sources, portable non-contact thermometers, combustion efficiency monitors, portable gas analysers, opacity and dust monitors and carbon monoxide detectors. “We are very excited to launch of our redesigned web platform,” states Ben Wileman, Division Vice President of Sales and Marketing for AMETEK Land and AMETEK Surface Vision. “We believe it demonstrates our commitment to create the best experience possible for our customers and web visitors. With a fresh, new look and feel, the revamped website delivers a fully responsive experience that gives users a seamless transition from desktop to mobile browsing. AMETEK will update the site regularly with business and product news, service updates, and industry developments. Visitors are encouraged to sign up for the AMETEK Land newsletter. AMETEK Land is a business unit of AMETEK, Inc. a leading global manufacturer of electronic instruments and electromechanical devices. AMETEK Land designs and manufactures a wide range of instruments for industrial non-contact temperature measurement, combustion efficiency and environmental monitoring. Marina Wood or Rebecca Hart, tel +44 (0)1709 300130, email marina@dragonflypr.co.uk or rebecca@dragonflypr.co.uk.